Home built (DIY) small electric buggies and go kart plans - plans for DIY 1500W electric kart. UPDATE MAY '08, I've made up a set of preliminary engineering drawings for the 1500W kart and bundled them at no extra cost with the Paid-For plans sets. Although the design is as yet untested details of the design are now available for interested builders - see also Page 2. One of the most popular pages on the site is the 500W Electric Kart page. It was a design intended for the "smaller" driver and as a result most teenagers or small adults simply won't fit in it. 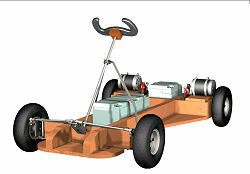 I've had a go at a design for a larger electric kart that might be of interest to the older builder. I haven't found the time to build this 1500W kart and try it yet but the design is fairly straightforward and I don't think it will throw up any significant build problems. As with most of the other designs on the site I've tried to keep this one as simple as possible whilst retaining a good level of performance. This electric kart design is for a 1500W machine powered by two 36V 750Watt DC PM motors - each driving one of the rear wheels. Depending on the reduction ratio used the top speed could be around 20-25 mph - easily enough to warrant secure seatbelt and seating arrangements and the use of a full-face helmet. The drive uses single stage roller chain transmissions which significantly simplifies the build and also gives some scope for customising the gearing ratios. The drive to each rear wheel is also fitted with a disc brake. The 3x12V batteries to power the kart are set low and along the fore-aft centreline and contribute to what will be a very low center of mass. This, together with the kart's 900mm width, will result in the good turn stability that is characteristic of many karts. The steering mechanism is a simple column and lever arm arrangement and to keep the design as simple as possible I've used symmetrical connecting rods to join each front wheel to the lever arm. The front wheels pivot about vertical king pins, a support arrangement that should be simple to make and robust in use. Lock to lock the front wheels will move over +/- 40 degree range giving the machine a good level of manoeuvrability. This will be assisted by the differential behaviour of the independent drive to each rear wheel. The wheels are inexpensive 10" pneumatics with steel rims. The main vehicle chassis is a simple to build glued and screwed timber construction. Ground clearance is fairly limited at roughly 50 mm (2") - so the design is intended primarily for running on good drive surfaces and not for off-road use. Should be okay on smooth (mown) grass surfaces. 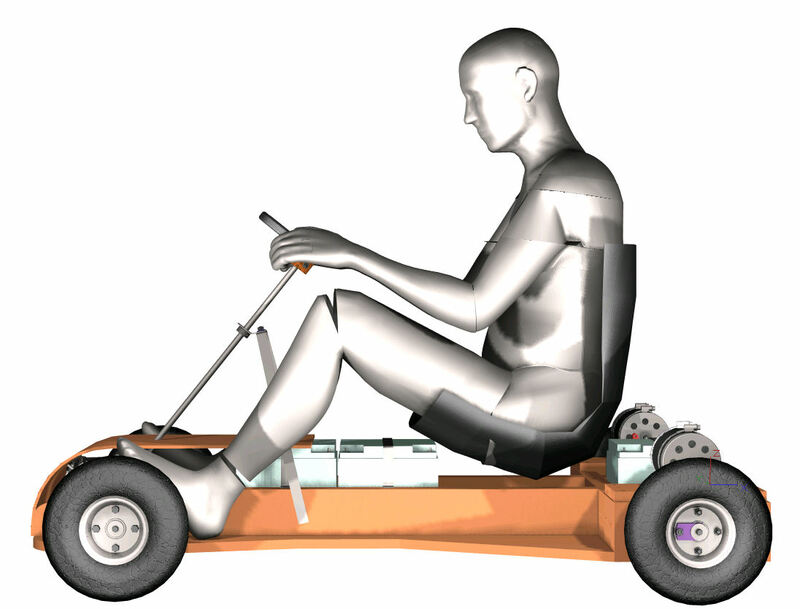 In use the kart will need to be fitted with a strong karting style bucket seat to ensure the driver is supported properly and the seat would be securely fixed to the main chassis longerons. Seat belt attachments will also need to be fixed securely to the main structural elements of the chassis towards the rear of the seat. A 36V reversing controller will suit the design. The combined rated current draw of the two 750W motors will be around 50 Amps, this will peak at over 100 Amps during hard acceleration so a 100+ Amp 36V controller is probably required. Assuming an average current draw of roughly half the rated current of the motors the 3 x 12V 40 AmpH batteries should give roughly 1.5 hours continuous use between charges (load and driving style dependent). 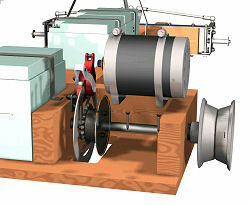 Left - the motor drive arrangement (some structure removed for clarity). I thought it would be interesting to experiment with taper-lock compression fittings here. The rear axle drive sprocket and brake disc are mounted on a compression fitting "hub" made up from a heavy chain sprocket and taper-lock bushing. The Taper Lock bush has a torque capacity roughly 4-5 times the rated drive torque through the axle so it should hold well and also be easy to fit on keyless shafting. The axles are supported in needle roller bearings housed in the timber chassis structure. 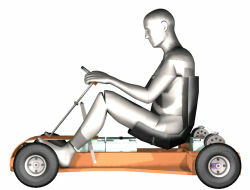 Right- a view on the core elements of the kart (seat and covers removed). As you can see the basic design is fairly simple and has scope for individual customisation - eg steering wheel choice, seating and choice of colours. Covers will be required to keep curious fingers out of the chain drive area. As always with electric drives care should be taken when working at and around the hot motors. Batteries should be securely strapped down to the chassis. As I mentioned I haven't yet found the time to build and test the design. It looks to me as if it should work though - I'll keep you posted. Copyright © 2006-2008 BFF Design Ltd All Rights Reserved.